10 May 2010. The logo to the left indicates the source of the story this post begins with. FOX, being fair and balanced, got the story from The Sun, the fair and balanced tabloid from the UK. The story begins: "An Indian holy man has amazed a team of doctors by not eating or drinking anything for two weeks." To be fair and balanced: this story is all over the Internet. 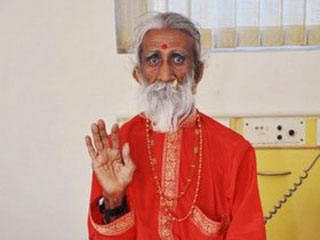 I wrote about this "holy man," Prahlad Jani, in my last newsletter. He claims he hasn't eaten or drunk anything for over 70 years. About six years ago, Jani pulled this same publicity stunt and it was reported by the BBC. In 2003, Jani and his promoters, led by Dr. Sudhir Shah, were debunked by Sanal Edamaruku of the Indian Rationalist Association. "The Indian Ministry of Defence (MoD) and the NASA have obviously been taken in by the absurd claims of a village fraud," wrote Sanal Edamaruku, Secretary General of the Indian Rationalist Association, in a letter to the Indian Defense Minister George Fernandes. "It is shocking to see that government officials and scientists are so gullible to believe that a human being can survive 60 years without food and water! The claim does not only contradict experience and common sense, but also our well-established biological and medical knowledge about the functioning of the human body. It is absolutely impossible that it is true - if it was, it would disprove the laws of physiology and we would have to rewrite our scientific text books!" ....The Indian Rationalist Association has experienced specialists for such cases and a long track record of successful investigations into similar claims. Up to now, all of them have been exposed as frauds. In 1999, there had been the widely reported case of Kumari Neerja from Jalaun district (Uttar Pradesh state), who claimed that she was the reincarnation of the Saraswati, the Hindu goddess of letters and literature. She stayed alone in a small closet and allegedly did not take any food for five years and did not excrete urine or stool. Since her managers announced that she would soon transform into a lifeless statue of Saraswati, the police were alarmed. In cooperation with the police, our young rationalist investigators and physicians verified her room and found the entry to a little toilet hidden behind a shelf and a brick hole, through which she received food. Blood tests revealed the presence of glucose, indicating the intake of food. When finally a harmless gas, causing vomiting sensation, was released into her room, she vomited pieces of chapatti and potatoes. The confused woman turned out to be a mental case and was admitted to the local government hospital. In 1992, Sanal Edamaruku exposed the godman Pilot Baba who claimed that he survived in meditation under water for five days without breathing. Pilot Baba's under-water feat attracted national and international attention. He constructed a huge swimming pool in a Delhi public park, climbed down in front of a crowd of 4000, ordered water to be pumped in and stayed there underwater for four days. That was at least the claim. But Edamaruku and his assistants exposed him. They found out that there was a special secret pipeline connection. Though water was pumped in, the tarpaulin-covered pool did not get wet inside, and the Baba had a comfortable time on its dry ground. Four years later, in 1996, he tried it again. This time he claimed to stay for four days buried under the earth. Edamaruku exposed him again in front of television cameras. This time he was sitting comfortably in an underground dug-up room. Dr. Shah has been in charge of three similar investigations over the past ten years, and he has never allowed independent verification. In 2000, he was asking for funds to investigate a man he claimed got his energy from the sun, just like plants do. In 2003, he even approached NASA for funds to investigate Mr. Jani, claiming astronauts might benefit from the research. This particular hospital, led by this particular doctor, keeps on making these claims without ever producing evidence or publishing research. Some might find it amusing that the Daily Mail—not known for its fair, balanced, and skeptical reporting—finds the Jani story a bit of a stretch, even if it tugs at the apron strings of little old ladies with infinite faith and a willingness to suspend disbelief in the incredible. update1: 16 May 2010. Rationalists doubt claims made for 'Mataji' Prahalad Jani The Gujarat-Mumbai Rationalist Association (GMRA) has said that Jani's claims have never been proven....Secretary of GMRA Keeran Trivedi said in a press release that Jani's claims have never been substantiated, and that such baseless superstitious claims should not be fuelled further. The release says, "We rationalists have challenged Jani's claims in the past as well. US-based rationalist Deepak Patel had offered to get Jani checked in the US, but he has not responded. At regular intervals, drama is created about Jani's alleged abilities, but the reports of his medical examinations are never made public. Moreover, the team of doctors is always the same, as is the hospital." new Prahlad Jani in EsoWatch.com, the wiki of irrational believe systems (From the FAQ for EsoWatch: "we are not associated with any sceptic organization. We like many sceptic resources, but usually they are a bit tame for our taste.") The Prahland Jani article is very detailed and about as objective as one can be about an incredible story where access to all the data is limited by interested parties. Note: most of the articles on EsoWatch seem to be in German. Of those in English that I have looked at, most have some sort of connection to quackery in Germany and to Germanic New Medicine.